Family of faith: Gerry and Claire Purcell with their daughters Moira, 4, and Niamh, 3. IT may be difficult for expectant fathers, who are doctors, to choose whether “to be the dad or be the doctor” when baby is on the way. 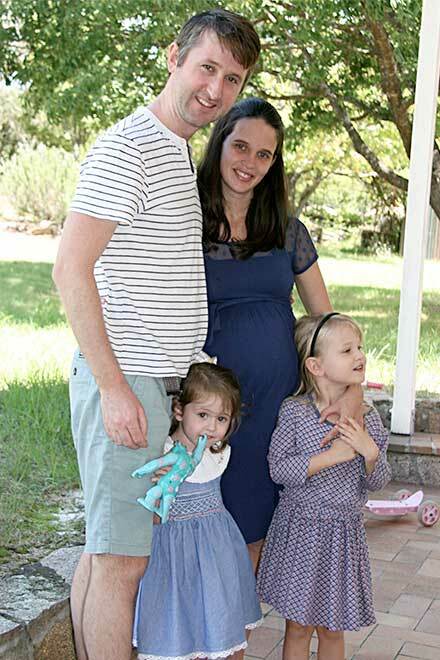 Posing the question to expectant parents Gerry and Claire Purcell, who may welcome their third child between the writing of this story and its reading, it was the younger of them who answered adamantly. “Gerry will be the dad,” Claire, 25, said of their impending third child’s birth. “I’ll try very hard,” Gerry said of his hope to not “blur the boundaries”. Their story of an expanding family isn’t too dissimilar to others’ although broader conversation allowed deeper understanding of the families from which they originate, of the decisions that now permeate their own parenting. “Claire and I both come from families who are intensely Catholic,” Gerry said. Gerry, the second-eldest of five, whose mother is also a doctor and father works in telecommunications, said that “something different” was the decision to home-school at a time when no other Catholic families in Toowoomba were. “My parents were quite courageous and I admire them,” he said. The medic, who spreads his time between Stanthorpe, Warwick and Goondiwindi hospitals, said home-schooling was a notion he first “rebelled against quite strongly”. “But by the time I was to start, it was by my own choice because I saw my siblings enjoying it so much,” he said. Rockhampton-born Claire, the fourth born, was among a family of about double the amount of siblings. Her parents, both teachers, chose local schools for their children at times when it suited varying needs. Claire said by “about Year 5 or 6, when some of them were getting a bit ratty” the need to move into forms of distance education, offered from the home, was obvious. “We were very self-directed (with education),” she said of those studying from home. The placid duo both grew up with a combination of constant Mass attendance, prayer, Bible study, robust meal-time conversations about faith and a daily praying of the Rosary. Studies in the Purcell home were dedicated to the patronage of St Joseph. Gerry learnt early to serve at the altar in Sacred Heart Parish, Wilsonton, in Toowoomba’s Western Deanery, while Claire’s family lived in a few different locations including Canberra but returned to St Mary’s Parish, North Rockhampton. At various intervals during their formative years, both Gerry and Claire took part in camps for home-schooled children and others, whose parents desired to forge links with Catholic families. Gerry said these Brisbane, northern NSW and central Queensland camps were opportunities to “make like-minded friends … (and) come together for daily Mass and catechesis”. “The parents would meet to support each other and share practical ideas about what to teach and what resources to use,” he said. “They would discuss how to keep their family safe in the world. 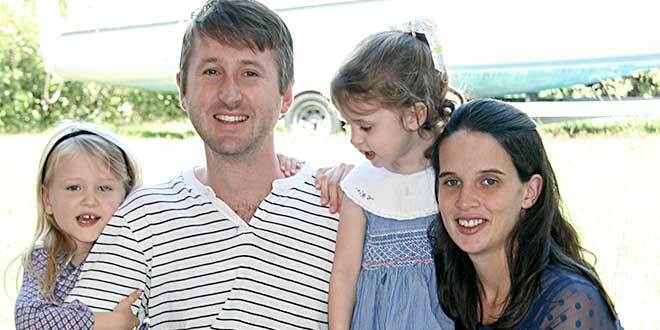 The Purcells said their upbringing “was very much steeped in the faith”. Remembering crossing paths at various intervals, Gerry and Claire officially began dating when he’d graduated as a doctor and she was studying pharmacy. Gerry said he knew he was “onto a good thing” when Claire agreed to his many “adventures and misadventures”. “I expended a lot of my teenage hormones on chasing the next adventure, whatever form that would take,” he said. A love of boating was expressed in “trying to make boats go as fast as they could” and nowadays “as safe as they can”. As a couple they were members of the Latin Mass community at St Luke’s, Buranda. Gerry and Claire’s wedding was a High Mass there in 2011, Claire saying exposure to Mass in Latin was “beautiful”. “To have a broader experience of how the faith can be expressed is very useful,” Gerry said. “If you only have exposure to one of the forms of the Roman Rite then you might think that’s the only way of doing it. With a stint living in Bundaberg as newlyweds, Gerry said his work schedule was so gruelling he often “turned up to Mass in surgical gear”, adding “There was no time to change”. While there were times where Mass attendance was physically impossible because of his work schedule, his faith never wavered. For this he thanks his parents and together, the younger Purcells are discerning ways such firmly held beliefs would be imparted to their children. “I don’t think the environment today is any harder than what was offered to our parents. I don’t think the challenges are significantly different at all,” he said. What has changed is Gerry’s “slowing down” as a dad to Moira, 4, and Niamh, 3, and his ability “to be less selfish”. Claire said that becoming a mum was a learning that all the parenting decisions and ramifications came down to their choices. The expectant mum said she was greatly relieved that recent submissions of changes to the legalisation of abortion in Queensland didn’t come to fruition. “I felt vulnerable on behalf of my unborn baby, knowing babies could have been aborted at the same stage that I am at,” she said. Gerry said abortion realities were another situation “without much that has changed”. He was encouraged, however, by the youth and vitality at the recent pro-life rally in Brisbane. “The pro-life movement is alive and well and not going away,” Gerry said. The 32-year-old was honest about how any legislative changes to abortion laws would affect his livelihood. “From a doctor’s point of view it becomes personal when the legislation might change and abortion becomes legitimate medical care,” he said. “In places like Victoria it has the potential to do me out of a job. Gerry said he thought what had changed “is greater hostility towards Catholicism”. “There was a time when Catholics were tolerated in secular society,” he said. In October the Purcells are planning to take their young family on a month-long sailing adventure, leaving behind creature comforts and any form of negativity. They are spurred by the hope of renewing what was modelled in their youth and continuing active faith expression. “Our parents forged ahead and showed us kids how to bring up a Catholic family in a world that seems to be increasingly hostile to Catholicism,” Gerry said. “I know we’ll have challenges but I’m also confident that the faith is so versatile. “It’s applied itself to 2000 years of history and there’s no reason it can’t be applied to our generation in the same way. “Claire and I often express how thankful we are to have the faith, especially whenever we have a question … we go to the faith and have an answer ready, confident it’s the right answer. With Gerry at the helm and sharing his love for adventure, Claire is looking forward to more blue skies ahead. “One thing that makes me feel confident in passing on the faith is having Gerry as the leader of our family,” she said.